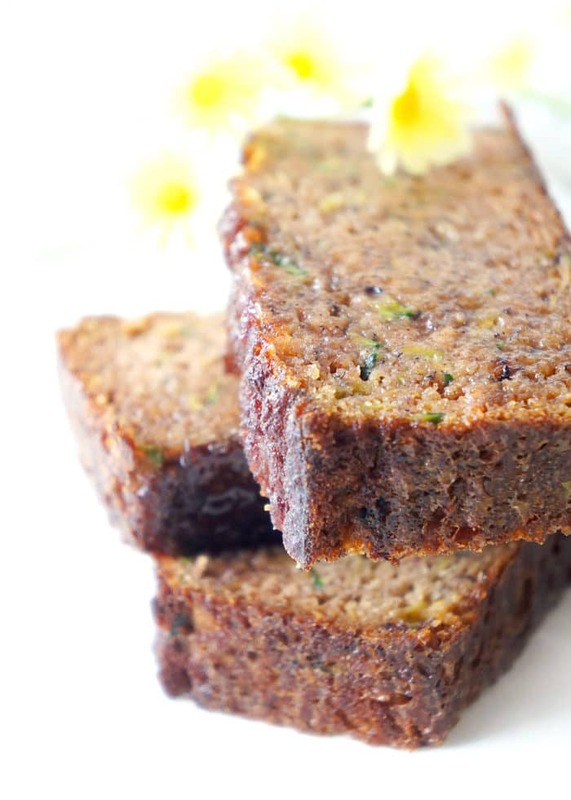 This flourless banana zucchini loaf makes a great healthy snack, dessert or breakfast on the run! It’s also packed full of nutrients, moisture and flavour! Gluten-fee, dairy-free and paleo! My husband is a big fan of snack-y type foods. When we first got married, I was really good about making him all of these healthy muffins, bars and balls so that he had snacks for the week. But I’ll admit that lately things have gotten a little chaotic and I haven’t been the best recipe tester. During my pregnancy, I was so exhausted that I found it difficult to find the energy to do any type of elaborate meal prep, especially since I was on my feet prepping food all day at work for cooking demonstrations. Building a baby is hard enough on its own and then you add in working 40 hours a week, taking care of the household, going to the gym almost everyday, and then recipe testing too? It was just a little too much. We still tried to eat as healthy as possible, but my creativity and level of motivation to cook was seriously lacking. And then after we had our baby Leo, of course, there was the whole adjustment phase, getting used to the sleepless nights and taking care of a newborn. Even though I was on maternity leave, taking care of the baby still felt like a full-time job! Now fast forward four months later and Leo is starting to become a little more independent. And by independent I mean he can entertain himself for a little more than 2 seconds at a time. So I’ve been taking advantage of his new found independence to take a few minutes here and there to experiment with some new recipes. 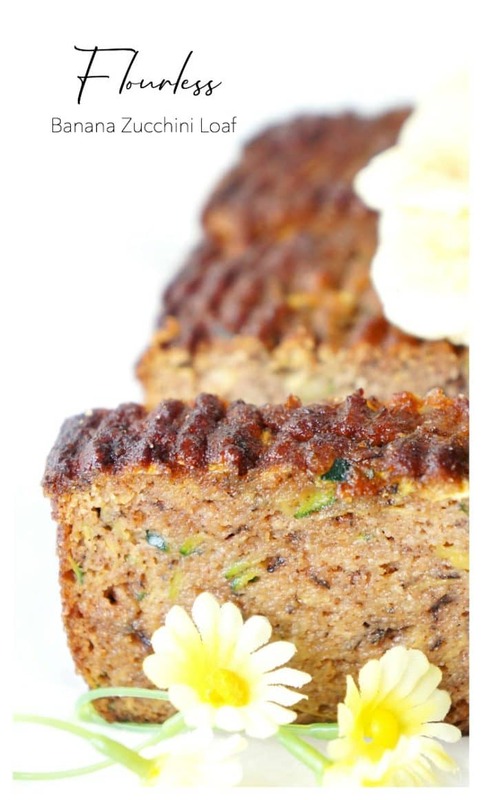 My latest experiment was this delicious flourless banana zucchini loaf. Don’t let the fact that it’s flourless discourage you from trying it. When I first took a bite of it, all I could say was YUM. And yes, I totally said “yum” out loud. It was THAT good! I was pleasantly surprised that the loaf was dense but still incredibly moist. It had just the right amount of sweetness mostly coming from the banana and the touch of maple syrup. And the combination of the almond and coconut flour gave it a delicious nutty flavor. 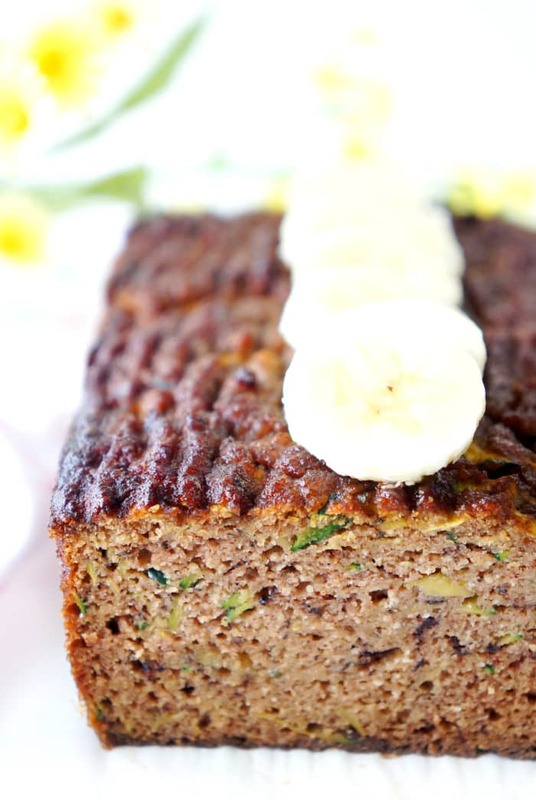 I also love how it incorporates the banana and zucchini because it’s a great way to sneak some extra servings of fruit and vegetables into the day. I experiemented with this recipe several times. First I distributed the batter into some silicone baking cups and baked it for about 45 minutes. The result was moist and flavour-packed muffins. The second time around, I had some really ripe bananas to use up so I made it into a loaf, baking it slightly longer for about 55-60minutes. Both times, it turned out equally delicious and moist. I think my husband is happy to have his recipe-testing wife back again because the snacks have been flying off the counter and from the fridge (like last week’s Mango Lime Chia pudding)! In a medium bowl, mash bananas until smooth (some lumps can still be present). Add eggs and beat together with banana using a whisk or fork. Mix in grated zucchini, vanilla and maple syrup. In a separate bowl, mix together the almond flour, coconut flour, cinnamon, salt and baking soda until all lumps are gone. Pour dry ingredients into wet and mix until combined. Bake for 55-60 min or until a toothpick inserted comes out clean. You can also make this recipe into muffins, Simply pour the batter into a greased muffin tin or 12 silicone baking cups. Bake for 40-45 min at 350 degrees F.
Wow! Love this recipe! Gluten-free and so simple! Can’t wait to try it out! Thanks Mikki! Hope you enjoy if you get a chance to try it! Thanks so much Abbey! 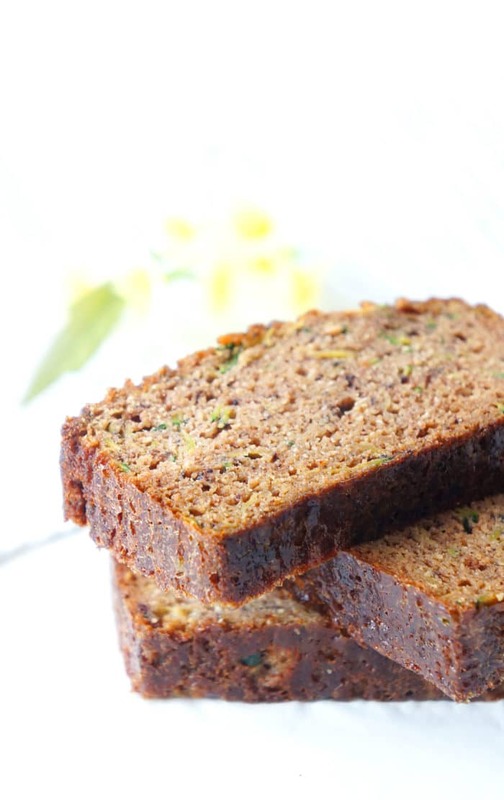 It’s a great way to use up that zucchini and it adds so much moisture to the loaf as well! I haven’t baked anything in a while, but I feel like starting off with this would be a good idea! *-* It looks so good! Please share more yummy Creation with us…! All the ingredients I always have on hand, I added crushed walnuts. 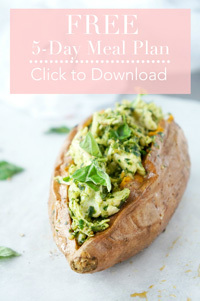 Simple, Guilt Free and Delish! Thanks JoJo! Love the addition of the walnuts! 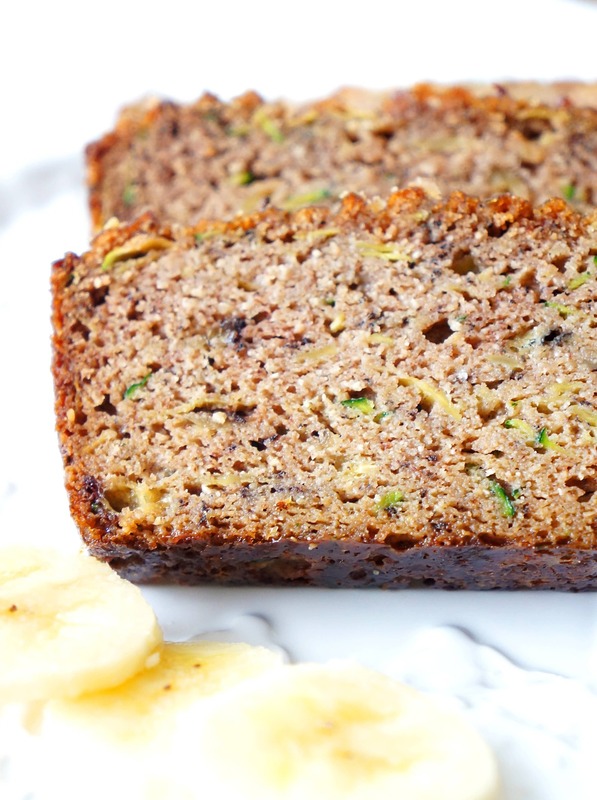 This flourless banana zucchini loaf is one of the best recipes I’ve seen in months. I have not made it yet, but I will definitely make it.